Happy Draecember everyone! 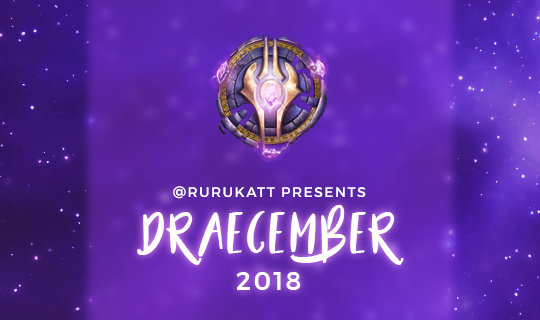 But what is Draecember you ask? 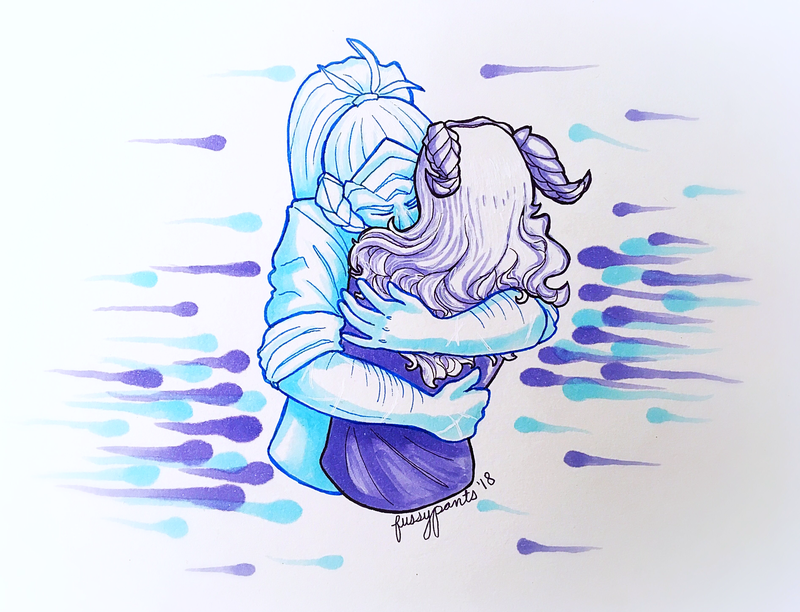 Draecember is an event celebrating the WoW Draenei race (one of my personal favorite races in the game) through art and writing! It was created by the absolutely fantastic rurukatt, and you can find out more information about the event here. This year, in the boundless amount of free time that I’ve had in college, I’ve decided to give the event a whirl for as long as I can! I will be posting my short vignettes and illustrations here on the blog. Please enjoy this little bit of personal writing I’ve been able to squeeze in between college essays and reports! Today’s theme was Hugging Someone. “Hey Kya, what happened to our lunch plans? Y’know how much I hate being the early one of the two of us,” the lean draenei man knocked on the door. His demeanor appeared perfectly at ease, almost languid, but underneath the lack of care, there was an almost imperceptible harsher edge. Letuus waited a moment more for a response before knocking again. “Kya, I know you’re in there, are you still asleep or something? It’s almost noon!” He placed his forehead to the door to listen better. Platinum blonde hair spilled down his shoulders. “There are many, many others who would love to have the honor of sharing a meal with me, I can leave and find one of them instead,” Letuus teased lightly, but a crease of worry wrinkled his face. This was very unlike Kya. Again, the room was silent. Finally, Letuus dropped the pretext, “Kya, I’m coming in, ok?” Gingerly, he turned the knob, stepping into the room and shutting the door behind him. Inside was tranquil. However, this was not the type of tranquility that brings peace, it instead was the type of tranquility that brings silence. Light filtered in from behind thin curtains, scattering sunbeams on the floor but leaving the upper half of the room shrouded in shadow. Kya sat on the edge of the bed, the top half of her face in darkness. “Kya…” Letuus started to speak, but it was as if the atmosphere ate away his words. He crossed the space reverently, careful not to step directly on the sunbeams as he made his way towards his friend. The man sat gently on the bed next to her. Kya’s face was utterly empty. No emotion peeked through – indeed, it almost seemed as if all emotion had been drained away. Her eyes were hollow. The scars, which usually blended into her dark purple skin stood out in particular clarity in the uneven light, smooth surface broken up by ridges and valleys of past battlefields. Letuus went to grab her hand but found that the paladin was clutching two things in her lap. He carefully pulled them away. The first was a box, carved from a lavender wood Letuus recognized as only growing on a distant, ancient world. Argus. The lid depicted a beautiful landscape scene, embedded with crystals that caused certain details to pop with clarity. The craftsmanship was impeccable. And, in typical Argussian tradition, there was no signature from the artist. Letuus inspected the box for a few moments more, before delicately sliding the cover off and peering inside. Letters. The box was full of letters. Written in different scripts and in different languages, there seemed to be a collection of different correspondences inside. Letuus recognized some as Alliance Military stationary. Others looked far more informal. The man rustled the papers aside, hearing slight clacking at the bottom of the box. Below the carpet of papers was an assortment of… detritus seemed to be the best word for it. Some of it was pieces of jewelry, others were natural rocks and stones, some still were children’s toys and knickknacks. Letuus frowned, dots beginning to connect but the clear picture was still out of view. He put the box aside, careful not to disturb any of its contents. Letuus next slid the other item out of Kya’s hands. It was another Alliance missive, signed in the telltale blue ink that marked all official documents. A jagged break split the wax lion’s face in two. Letuus reopened the cracked seal. The letter continued, but Letuus stopped reading there. Suddenly the pieces fell into place. He looked back over at the box, snatching up the letters again. Each one was addressed from a different person. And there were dozens upon dozens of them. The blood drained out of Letuus’s face. The woman was completely unmoved. She continued to stare forward as if she didn’t hear him at all. “Kya, I need you to snap out of this, ok? It’s going to be ok, you hear me?” Emotion was creeping into Letuus’s voice. Faces, unbidden, were springing up into his mind. Faces he would never, ever see again. “Kya, I need you to be ok. Kya, please!” Letuus was shaking her arm now. He could feel something hot rise in his face, feelings he didn’t want to feel anymore. Kya continued to sit there, numb and distant. “Light damn it Kya, you have to be ok! Because if you’re not ok, then I’m not ok, and I can’t be ‘not ok’,” He was shouting now, jumping up to his feet and pulling Kya with him. The paladin stood obediently, but still was silent. She still wasn’t there. Letuus threw his arms around Kya. Muscles made strong by years of combat held her tightly against him. He buried his face in her hair, breathing deeply the ever so faint scent of lily she carried. His heart raced, beating twice for every steady thump of her heart. He could feel as her breath caught, and now how it gradually evened out. Chest rising and falling in uniform. The world slowly stopped spinning. The faces slowly disappeared. And Kya’s arms, which had hung limply at her side, slowly reached around to hug Letuus back. This entry was posted in World of Warcraft and tagged creative writing, Draecember, Draecember 2018, draenei, fussypants, story. Bookmark the permalink.